The holidays are often a busy time, and a time to celebrate your office employees. After all, they keep your business running day in and day out. Planning your office party doesn’t need to be complicated. Steak-Out Charbroiled Delivery is here to help make this year’s holiday office party memorable, and we’re offering a special to beef up the deal! We understand the importance of a holiday party, which is why we’re offering a sweet deal to celebrate the holidays. Our hand-cut, 100% grain-fed, USDA graded steaks provide the perfect centerpiece. Our secret sauce is the stuff of legends, and we’ve been told on more than one occasion that it’s part of what brings people back for more! The ease of ordering, and the convenient delivery will make dinner a breeze. Of course, not everyone enjoys a seared steak (it’s true! ); our menu is designed to deliver different flavors for everyone in your office. Choose from our succulent grilled shrimp or chicken, or even a fresh charbroiled burger. We’ve got one of the best cheeseburgers in town and it’s sure to make your taste buds dance. You’re in luck if you live near Georgia, Alabama, Illinois or South Dakota. You’ve probably heard of us and our thick, juicy steaks that are grilled over an open flame. Our franchises offer catering that’s sure to delight your office staff for this year’s holiday party, and once you’ve tried our delicious offerings, we know you’ll become a regular! Simply log onto our website and place your office order. If it’s easier, you can also place your order by fax or phone call if you prefer. Our order form makes it so easy to fill out orders for one or one hundred. Each of the orders will arrive individually marked with a name, making it easy to hand out lunch to the whole office. Anytime you want to celebrate (or just enjoy a great steak) we can accommodate you. The holiday season is upon us, and we know that Thanksgiving and Christmas are the perfect occasions to gather your friends, family and co-workers together reminiscing over delicious food. While it’s great to get together with loved ones, it can be stressful to get the house clean, prepare the menu, and make sure you have enough space to prepare the food. Instead of being stressed out this year, let us do the cooking (and the clean-up). Our holiday catering makes it easy to choose from a full menu of fabulous food – whether you are choosing buffet-style or you need to order for special dietary restrictions. We bring everything – even the cutlery! You can relax and enjoy conversation with your colleagues and employers instead of fussing over preparations for your holiday meal. Let us handle your next holiday party or big event. Our amazing steaks come in a variety of options to choose from and are all USDA graded American beef, so there are no worries about the quality. You can choose exactly how you want your steak prepared – from rare to well-done. Be sure that you remember to leave room for dessert (Death By Chocolate Cake, anyone?). This year, we’re sweetening the deal with our famous sweet tea! 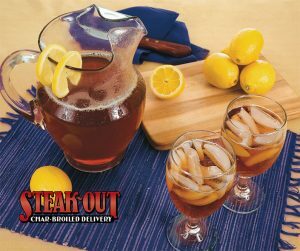 When your office orders $50.00 or more in catering, we’ll include a free gallon of our sweet tea. How great does that sound? Make sure that if you’re ordering online, use code FREETEA to receive your free gallon of our satiating sweet tea. Check us out online or give us a call to order dinner tonight or to have us cater your next office gathering or Christmas office party. We make it easy to enjoy a great steak.